If you’ve been charged with buying new office coffee machines for your colleagues, you will doubtless be starting to feel overwhelmed by the choice and range available. 1. What do you want the office coffee machines to offer? Will your colleagues be demanding a variety of drinks 24/7 or just a few carefully selected brands? There are a wide range of drinks available including single cup coffee, tea, hot chocolate and specialty drinks such as cappuccino. 2. What space do you have available for your office coffee machines? An office of ten will need a very different solution to a factory of 500, so whether you’re looking for a small and perfectly formed coffee machine that can be popped on a desk or a full blown office coffee machine which offers the works, the choice is very comprehensive. 3. How do you want your drinks dispensed? High capacity office coffee machines will have a one-touch operation, delivering a wide selection of hot and cold drinks brands with no waiting and zero mess. not your employees pay for their drinks. Usually designed with 250 plus employees in mind, these office coffee machines offer a reliable and consistent drink time after time. If you’re looking for something a little smaller, try to find something efficient and compact, specifically designed to cater for the small to medium sized workplace. You could choose an office coffee machine with the capacity to deliver up to 400 cups from a wide drink selection, and you still get to choose the initial menu. These products are easy to operate, clean and maintain. 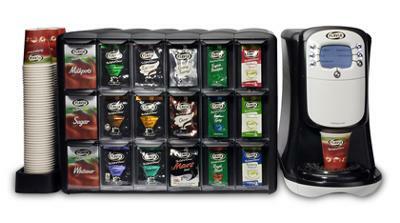 For companies a little smaller, drink stations, which are small office coffee machines, will create a stir. They brew direct from pack to cup, with users selecting the strength and size of the chosen drink. They can froth, whip, mix and blend, ensuring a coffee-shop experience in the office. 4. Will it be energy efficient? Most offices today have energy performance ratings to reach, making your choice of office equipment more selective. Quality office coffee machines will have good insulation as they will keep water hot for longer and reduce energy costs. 5. Is the Supplier Reliable? From single origin to blended coffee, achieving the flavour and aroma of a fresh hot drink is an art. Give some thought to a reliable supplier for your hot drinks vending supplier. Join in and write your own page! It's easy to do. How? Simply click here to return to Office Coffee Machine.